"Any true guitarist wants an awesome tone. A great tone for your guitar is how you further express your playing style on the guitar. I never paid much attention to guitar tone before playing in a band. I was satisfied enough with my line 6 as a practice amp in my bedroom. After spending some time in the studio to record my band’s first EP, that all changed. I set out to get the best tone possible for this EP. Here are some things I learned about guitar tone while in the studio. Guitarists who are new to exploring their tone options often think that it’s all in the amp. I talk to many guitarists who think they need a different amp when they aren’t happy with their tone. In my experience, the guitar itself has the biggest impact in your tone. This is especially true with acoustic guitars, but also applies to electrics. 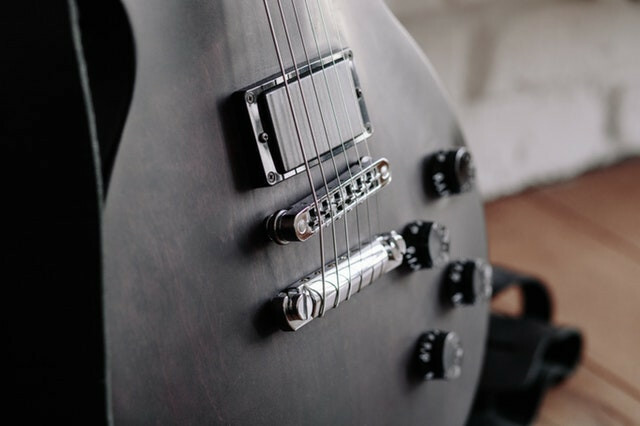 There are many factors that play into an awesome guitar tone, but on the guitar itself, the main things that affect tone are the wood type and pickups. If you’re seeking a warmer tone, a basswood guitar with some pickups that emphasize the low-mid frequencies might bring out more low-end from your guitar. For a brighter sound, solid mahogany and treble heavy pickups would do the trick. In rock music, power chords usually do the job. I make use of them almost exclusively for parts of songs where I want more movement in what the guitar is doing while maintaining a full sound. Sometimes, though, you want a part to ring out and sound very big and epic. It’s common for guitarists to attempt adding more layers to their recordings to achieve that bigger sound, but this can remove some of the textures that make guitars sound so great. Instead of layering your guitar tracks 4 times, try making use of bigger guitar chords. If you want a very epic sound, splitting the chord into 2 separate tracks can achieve greater note clarity. For our EP, we made use mainly of power chords on the rhythm guitar and octaves on the lead, and even this sounded epic. For other parts where we wanted an even bigger sound, finding different chords and adding some reverb made a big difference. Too many guitarists don’t understand the importance of a good speaker cabinet and, again, put all of their emphasis on the amp. A good amp is important, but a good cabinet is what makes a great guitar amp sound awesome. Good cabinets will add texture to your playing in places you may not have imagined. When I got my Orange 2x12, I instantly noticed that it reacted to my playing in bigger ways than some of the 4x10 Marshall’s I’ve tried. There’s a reason some guitar cabs cost a few hundred dollars while others are in the thousands. The more expensive ones are often constructed with thicker/harder wood and have bigger speakers that together bring awesome resonance to your tone. You don’t need to spend a ton of money to find a great guitar. Sometimes, you don’t need a new guitar at all – you just need new pickups. When I first recorded the guitar solos for our EP, I was using EMG pickups. These pickups are very popular among metal guitarists these days, but I didn’t like how they didn’t seem to pick up the resonation of my guitar that I felt while playing it. To my ear, the EMG pickups also had some annoying overtones in them when playing these solos. After trying everything else (different amps, cabs, and pedals) to fix the overtone and resonation issues, I decided to swap out my EMG’s for some Seymour Duncan Invaders. These pickups were extremely bass heavy (which might be why many guitarists don’t like them) so I did have to EQ my amp with the bass knob almost down to 0, but I love how they made our lead parts sound. It’s as if the resonation of the guitar is actually being captured now, which means the bass is felt now rather than just heard. If the issue with your guitar tone has to do with some weird harmonics (like overtones, for example), or sounds like it’s missing something, try switching out the pickups to fix this problem. There are tons of YouTube video demos for almost every pickup on the market. Many guitarists want a smoother sound on their lead parts, but I wanted the pick to be heard on every note of my solos. If you’re a guitarist who wants less pick attack on his leads, try turning down the treble, making use of your neck pickup, and using legato techniques instead of picking every note. On the notes you do pick, try moving the pick farther away from the pickup you have selected, and hold it at more of an angle. If you’re like me and want more pick attack on your leads, turning up the treble, making use of the bridge pickup, and holding your pick more flat instead of at an angle will help with this. In my experience recording, pick attack seems to be related to your pickup selection, how you hold the pick, and how much treble you have in your tone."